We had our PMQG meeting this past Thursday, and got back our solid blocks. 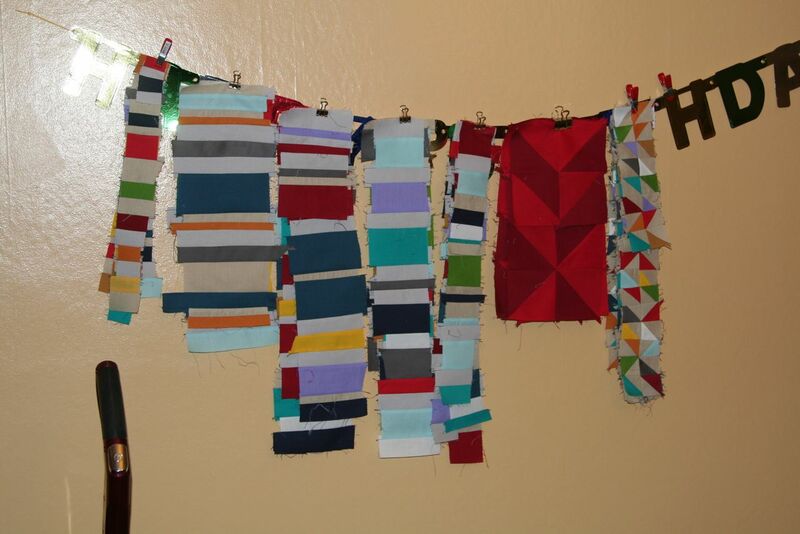 Elsa got my block, and made me an awesome mini-quilt. Hilariously (to me anyway), she's a vegan. She was a good sport about the bacon and eggs though. This was such a nice swap. 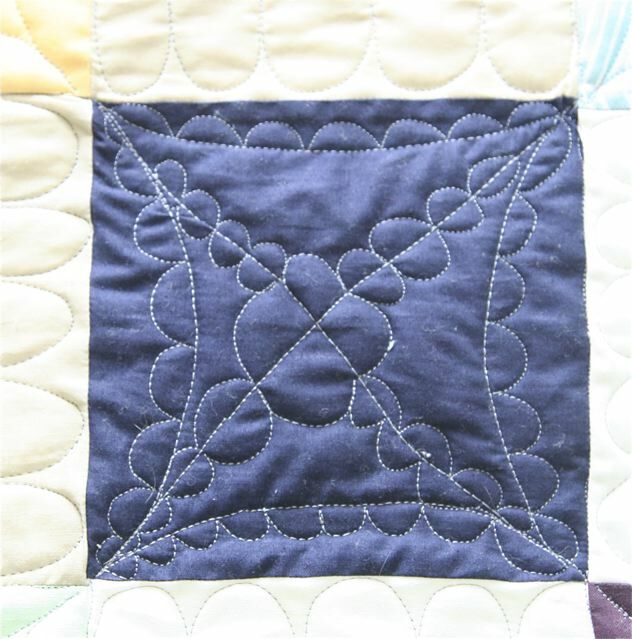 Elsa did a lot of things that I don't normally do with my quilts, like a pieced back, hand sewn binding, and stitching in the ditch, so it was fascinating to see what my work looks like with those elements applied. It's the details that are so great too. Elsa handed it to me with wrapped in this ribbon, with nicely cut edges. For some reason, it just makes it so much better. Also, this weekend we had our all day sewing event for the guild at Fabric Depot, and it was great, as always. Lots of talking, laughing, and sewing. 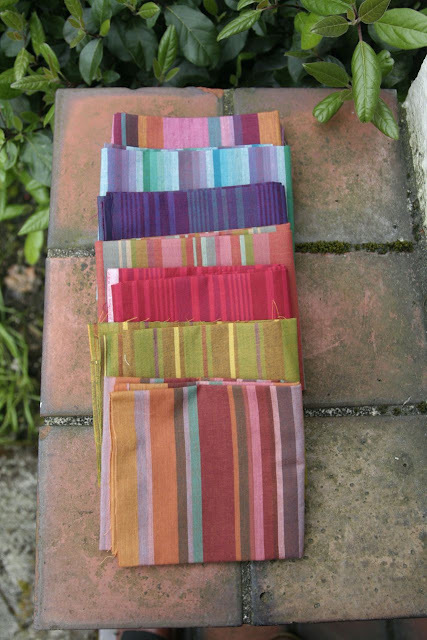 I didn't bring my sewing machine this time, but I did make a cutting guide for my quilt for the Project Modern organic challenge, and bought the fabric for it, which is always fun. I wish these events were more often, but I realize that not everyone in the guild's biggest responsibility at home is taking care of one weirdo cat and watching episodes of Law and Order: Criminal Intent. 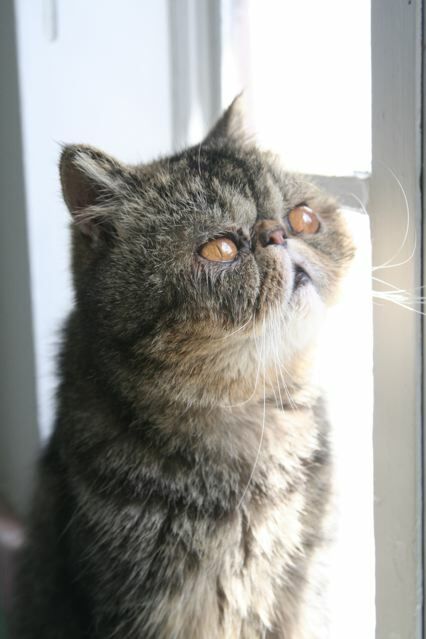 If they made a Law and Order: Cat Intent, they'd have at least one viewer. Fritz seems to have "settled" once again. 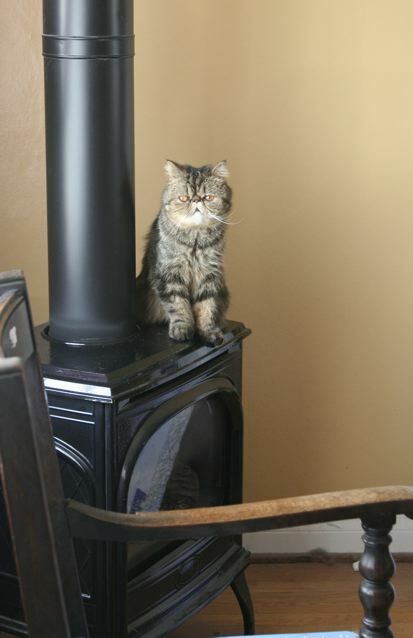 He's taken to sleeping/living on top of the gas stove. It's fine now that it's warmed up a bit (for Oregon anyway), but come Fall and Winter he'll need to move on. This is an interesting place for Fritz to hang out, because it's not quite big enough for him to really lay out on, so often times he'll be cleaning himself and fall right off the side, which is hilarious to me, but probably less so to him. We'll see how long this spot lasts. 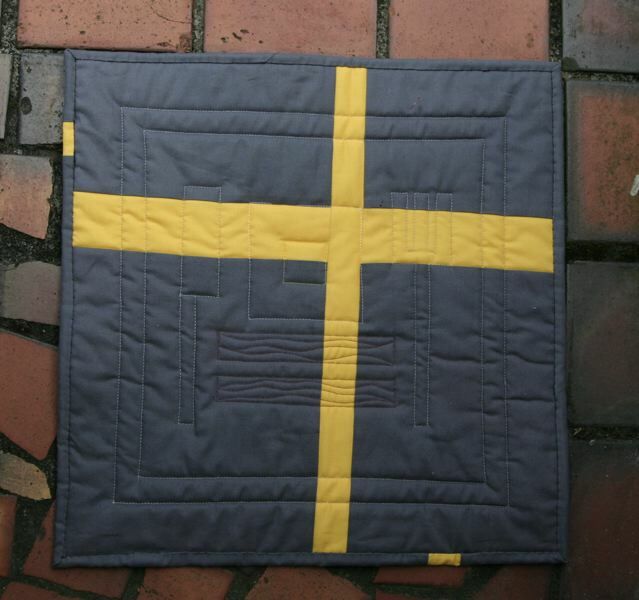 The PMQG is going to have a small show at the Sisters Outdoor Quilt show this year, and we, as a guild, are going to make blocks for a banner. We're supposed to turn them in at the meeting tonight, and me, being the last minute lady that I am, finished mine just now. It's not my usual style, but it was fun to make. The red bit was an attempt at roses. I saw a really pretty bush with red flowers awhile back, and thought that the combo of olive green and red was very interesting, and sort of unusual. 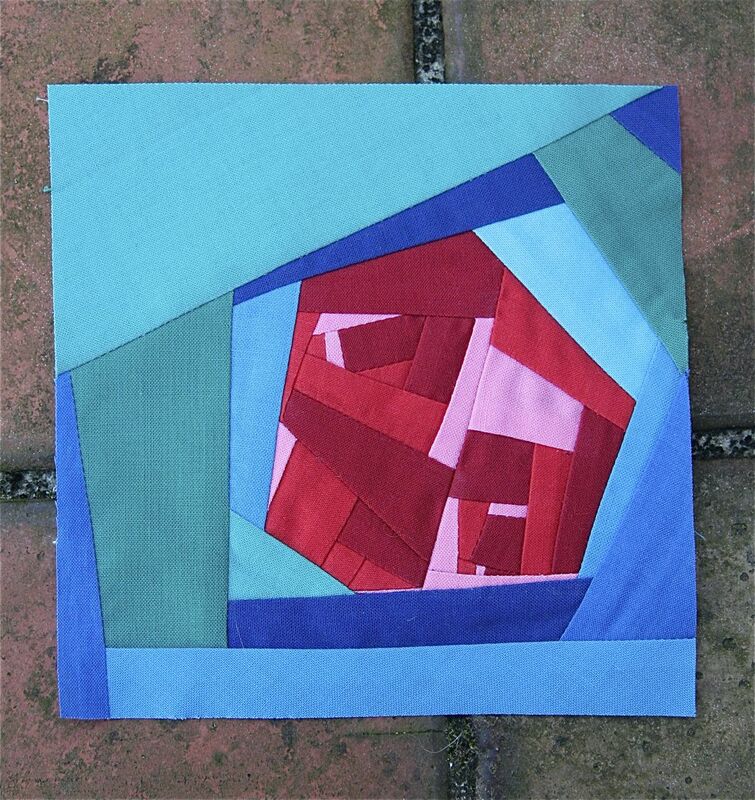 Someday I might want to make a quilt in this style with those colors, so this block was a perfect opportunity to see what it might look like. 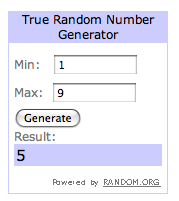 And the winner is, Christina! I'll bring it to the next PMQG meeting. Thanks so much to everyone who entered. You all alleviated my fears of hosting a giveaway that nobody wanted. 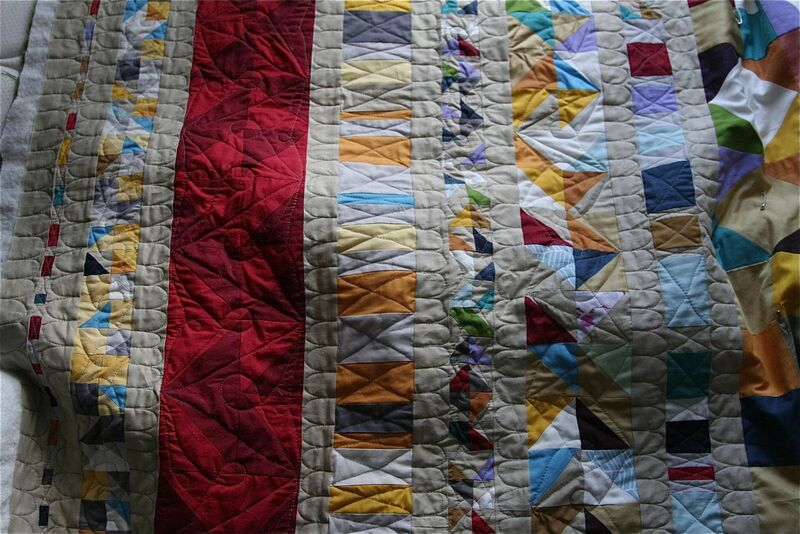 There is something cathartic about making a scrap quilt. I don't feel any particular need to save leftover fabric, because there are always more solid fabrics to be had, but I still feel guilty about throwing away leftover bits of fabric. Last year, I started sewing together scraps from quilts as I made them. I had no particular layout or end goal in mind. It was nice to work on between projects because there was no pressure or expectations. 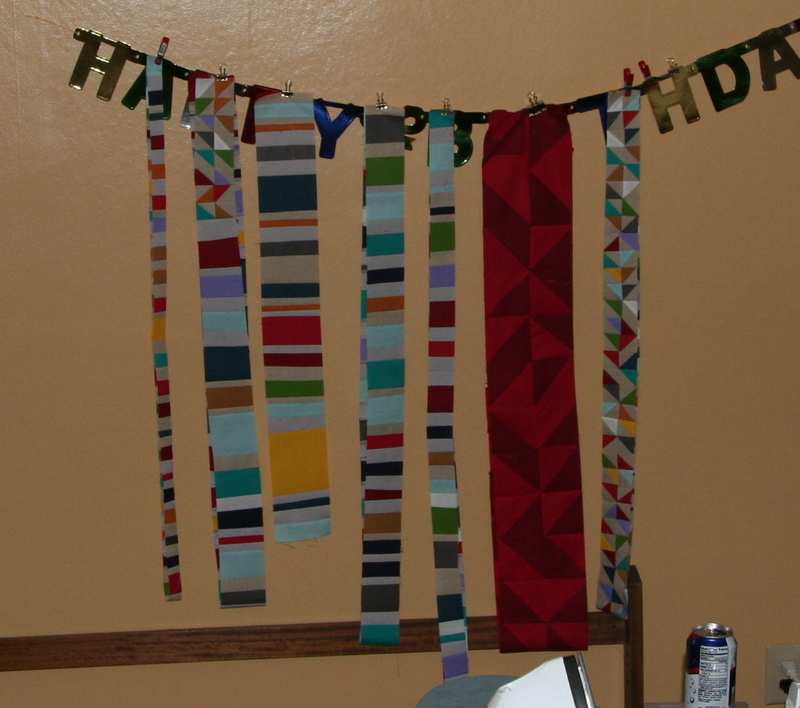 All the pieces were scraps, and various sizes so nothing had to line up or be precise. As time went on, I decided to put together scraps from all the quilts for a particular year and make a quilt out of it, and to keep a visual record of my year in quilting. 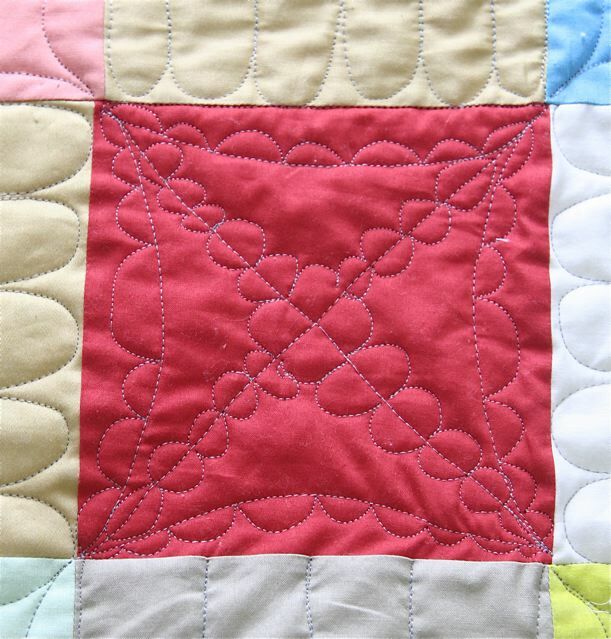 I've been calling it a biscuit quilt, because it reminds me a little bit of when you make biscuits, and you roll the dough and cut out the biscuits and repeat until you can't cut any more out. We always used to bundle all the scraps together for one lumpy looking biscuit. Sometimes that would be the biscuit that my brother and I would fight over, because we knew what all those perfectly round biscuits tasted like, but the lumpy biscuit was always a bit of a surprise. It's been a long time since I've rolled out biscuit dough though! 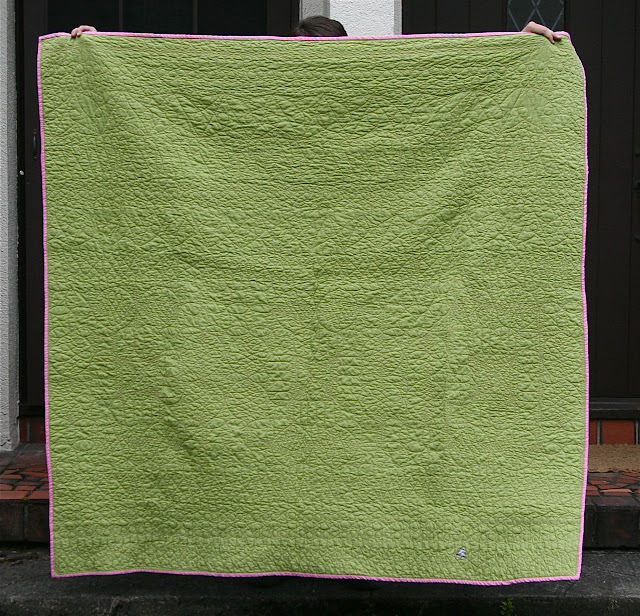 Maybe I'll just make quilts instead. 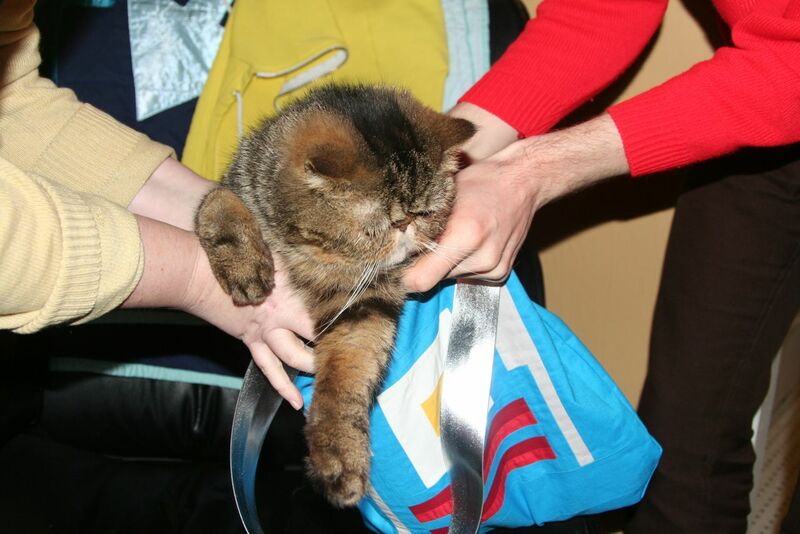 I looked up the meaning of the phrase "cat's out of the bag", and was a little surprised to find out that it (maybe) originally referred to the practice of substituting a cat for a pig in a bag. I guess they used to sell pigs in bags? 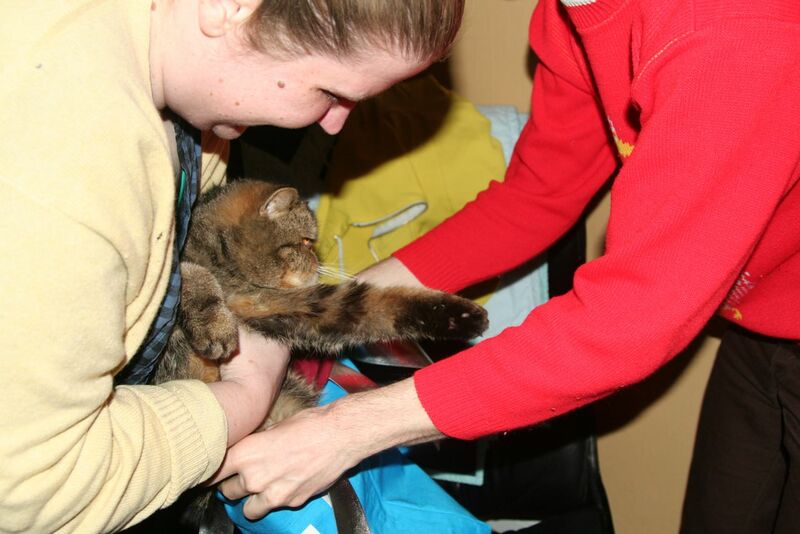 If the bag was opened, and the cat came out the jig was up, and you knew you were getting false goods. 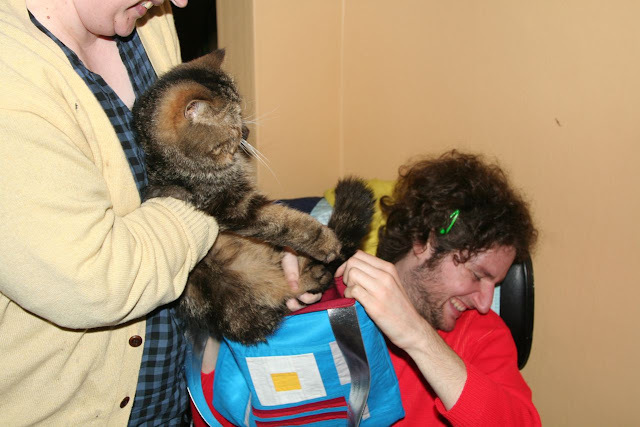 However, for anyone who has tried to put a cat in a bag knows, it's almost impossible to get them in back in there, in a more literal sense. Big thanks to my friends Nathan and Patrick for picture taking and bag holding! Has it really been 100 posts already? Well, I've had this blog for 2 1/2 years now, so maybe it's overdue. I did start my first quilt 2 1/2 years ago, and it has opened me up to a wonderful hobby, and surprisingly, a lot of new friends. 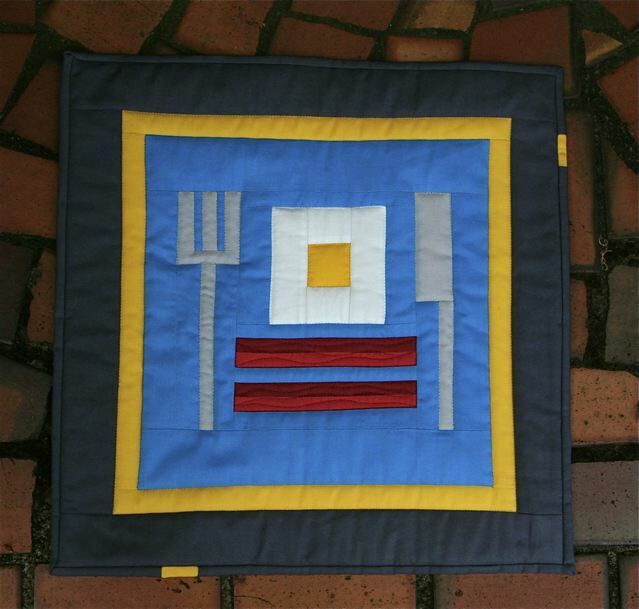 I'm not quite sure what I did before the Portland Modern Quilt Guild started, but I'm very grateful that it did. I've meet a lot of new people, gotten a thousand ideas, and found a hobby that comes with a built in community and a rich history. 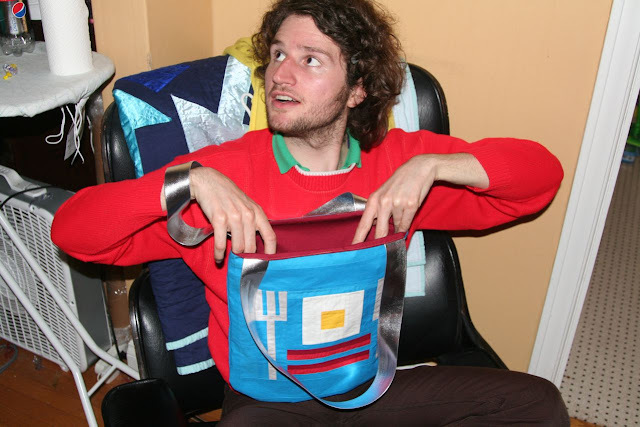 Look at me, getting all weepy over some bits of fabric sewn together! I've never done a giveaway before, but it seems like a good thing to do to mark the occasion. I've got to admit, I'm a little worried that no one will enter, but I'm going to cross my fingers and hope for the best! The giveaway is open to everyone, from anywhere. It will be open until May 15th, 2011, 12:00pm PST. So, without further ado, here is what is up for grabs! 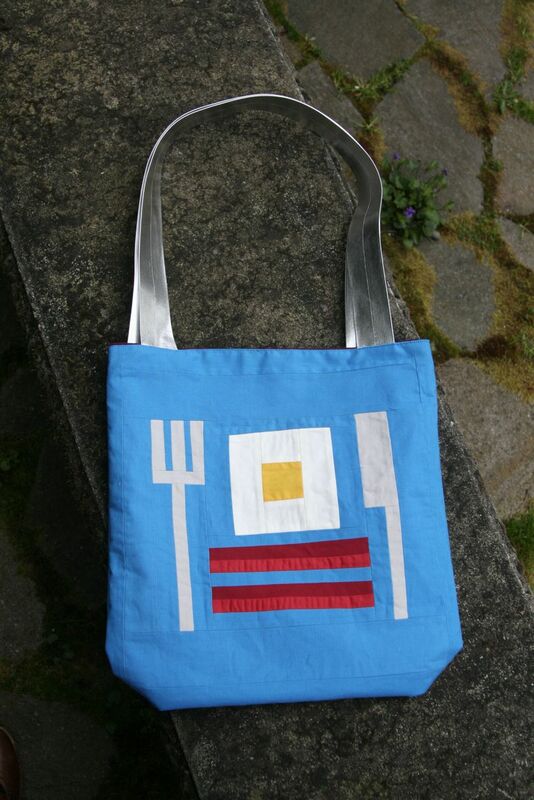 This bag is lined, and I used interfacing to help with stability. The straps are silver PVC. And, I made it myself! I've never made a bag before, so I was very please with how it turned out. And in that bag you'll find 7 fat quarters of Kaffe Fasset shot cottons. A special thanks to everyone who has read or commented on the blog, and an extra special thanks the person who found my blog through the following search, because, man, what were they even looking for? I hope they find it someday. Jill made this comment on my last post. I'm choosing to interpret it like this. 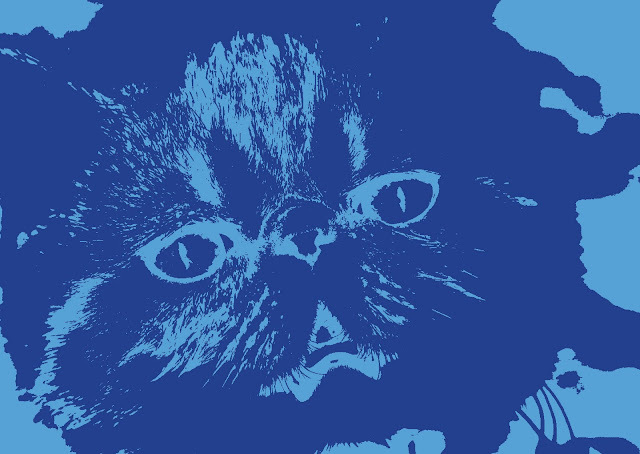 Although, after seeing the results, maybe I shouldn't have made a pop art portrait of Fritz. Fritz's horrifying visage aside, I did finish quilting my scrap quilt, and now all that's left is to bind and wash it. 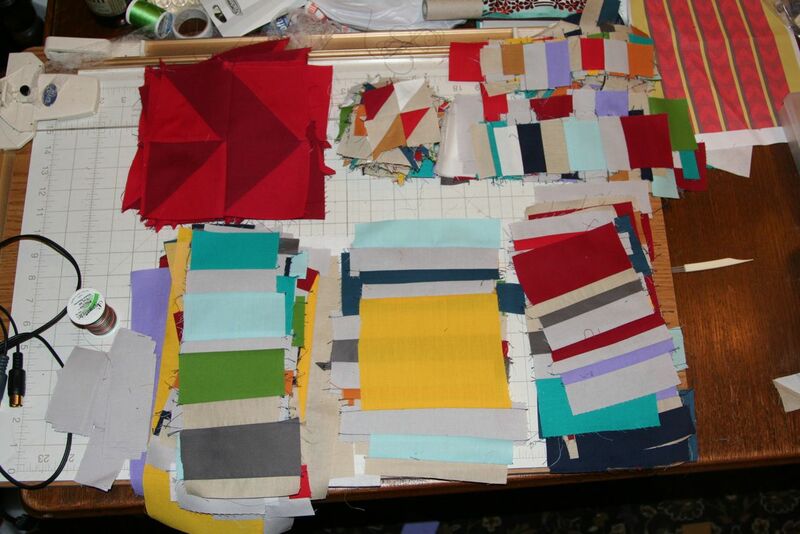 I'm aiming to get it done for the Blogger's Quilt Festival, which starts on the 13th, so I've got plenty of time. I never want to like the back of my quilt better than the front, but I really like how the quilting makes the back look. 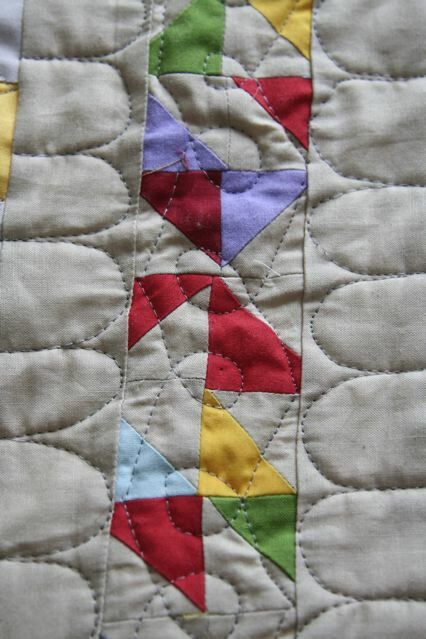 Sometimes it can be hard for me to determine if I'm improving my free motion quilting or not. I'm always looking at my work with a critical eye, and it's so much easier to find the flaws that honestly no one else cares about than to appreciate the good work that I have done. Although, some mistakes are pretty hard to miss! 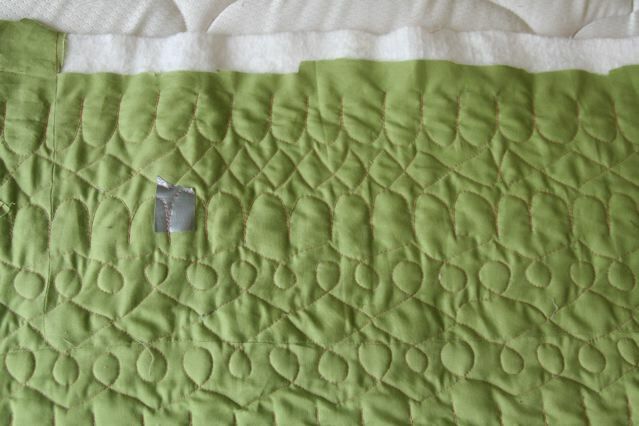 It pleases me that there was some pretty clear evidence of improvement in this quilt though. 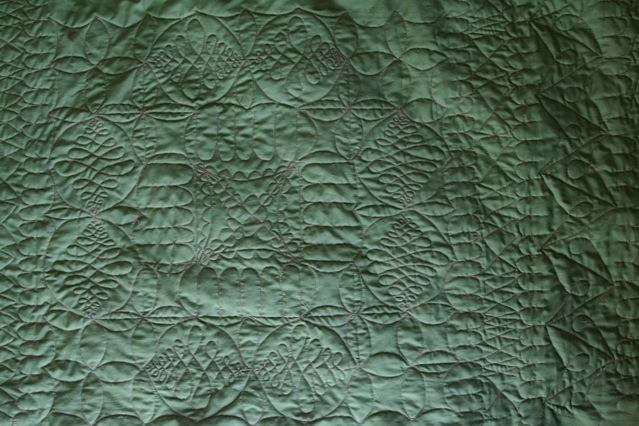 There were three center blocks, and every time I quilted the same motif on the blocks it got better. The pictures below are in order of when I finished them. None of them are perfect, but by the time I got to the red one it started looking much better. 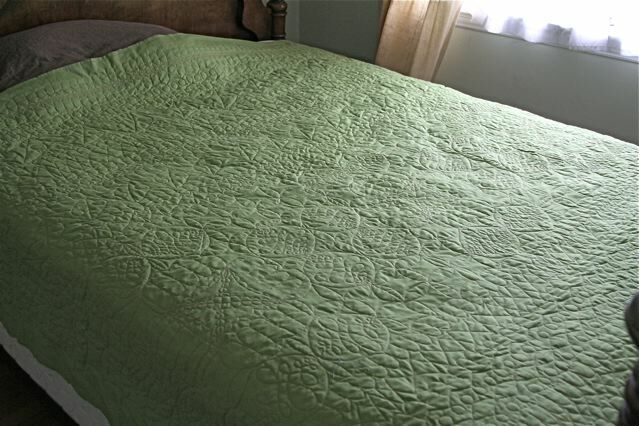 This kind of quilt is perfect for that type of exploratory free motion quilting because the piecing is so wobbly anyway that it doesn't matter if the quilting isn't perfect. In fact, it matches better when it isn't perfect. This has been a pretty satisfying project for me, but I'm glad it's almost done so I can move onto the next thing. Have you ever fallen in love with a photo of yourself? I did, yesterday. 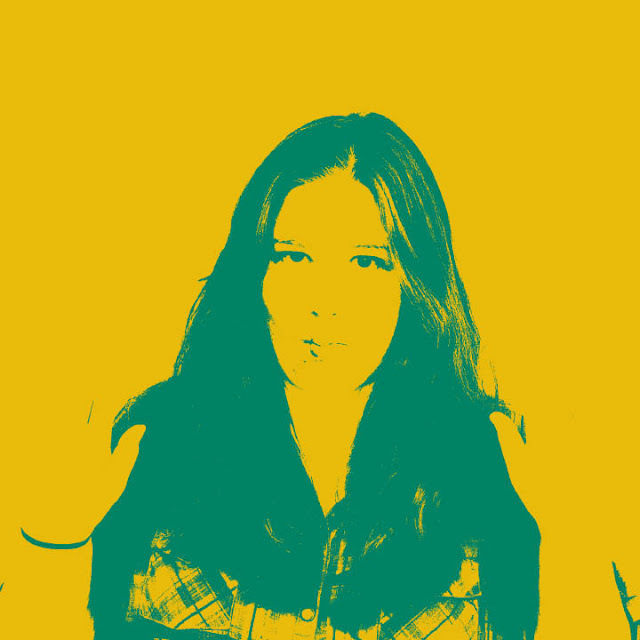 We had a class project that involved creating a pop-art version of yourself, and this is how mine turned out. And it's like, man! Look at those cheekbones! 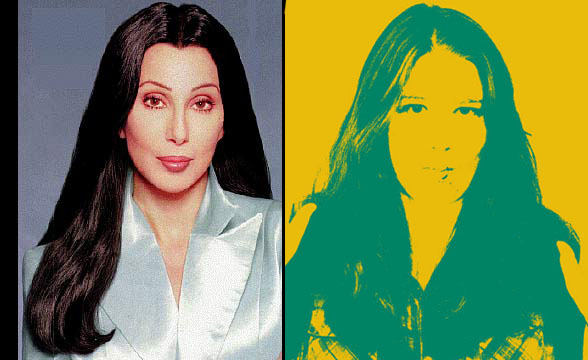 I think it makes me look like Cher. 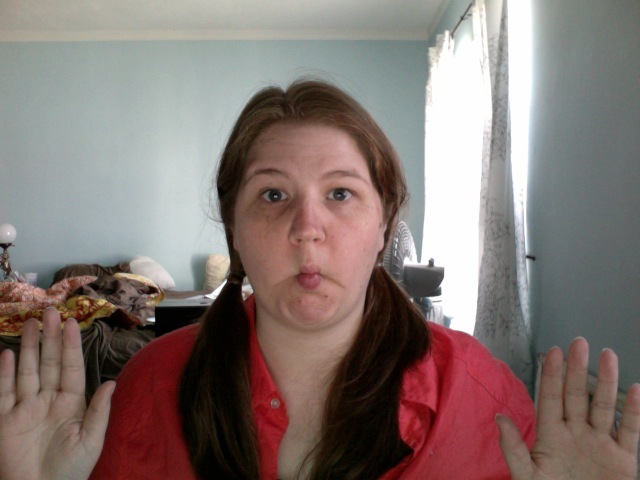 Now, I don't really have a long lean face with killer cheekbones or a super pouty mouth. Which, is not quite as attractive, but oh the magic of photoshop! It almost makes me want to get cheek implants. Almost. 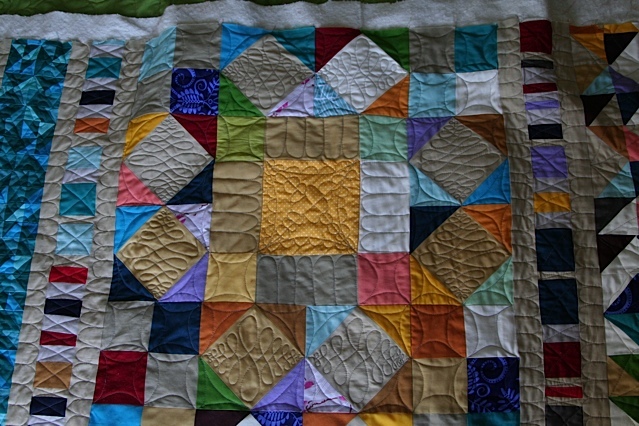 I've been trucking along on quilting my scrap quilt. I've got one more section, and then maybe some stitching in the ditch if I feel like it. I'm not great at it, but I do like the look of it. 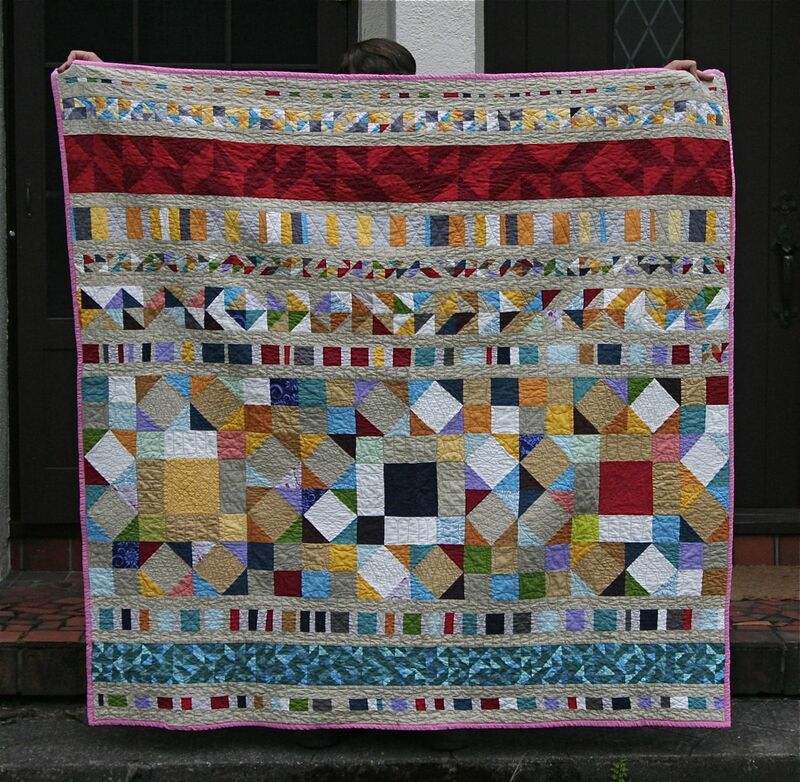 I'm not sure if this qualifies as "modern" quilting or not. 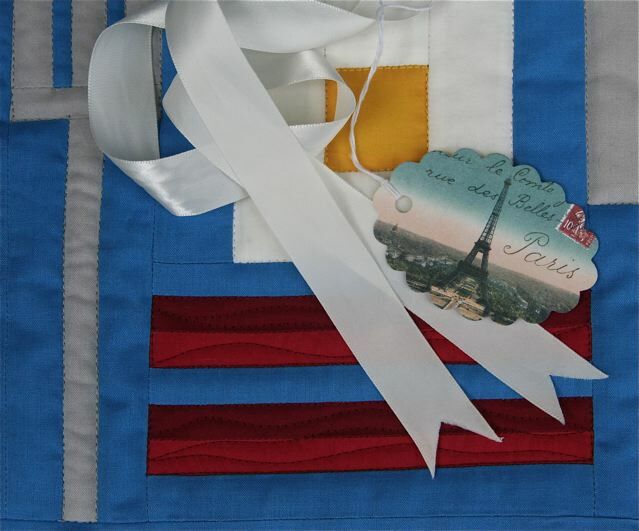 I'm not to worried about labels, but as I am a member of a modern quilt guild, so it is something I think about. Sometimes I think I've come up with something really modern, and other times not so much. 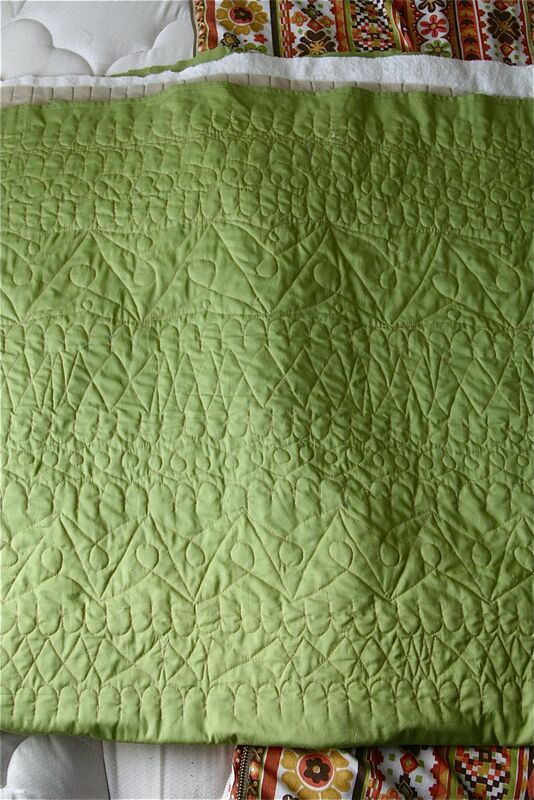 This type of quilting seems a little fussy for modern quilting, but I like the look of it. 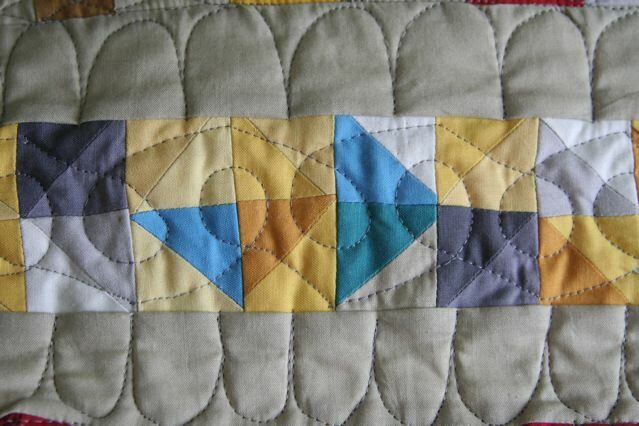 I guess I won't really know if this qualifies as modern or not for about 20 years or so, when we can look back on this period of quilting and see what the trends really were. 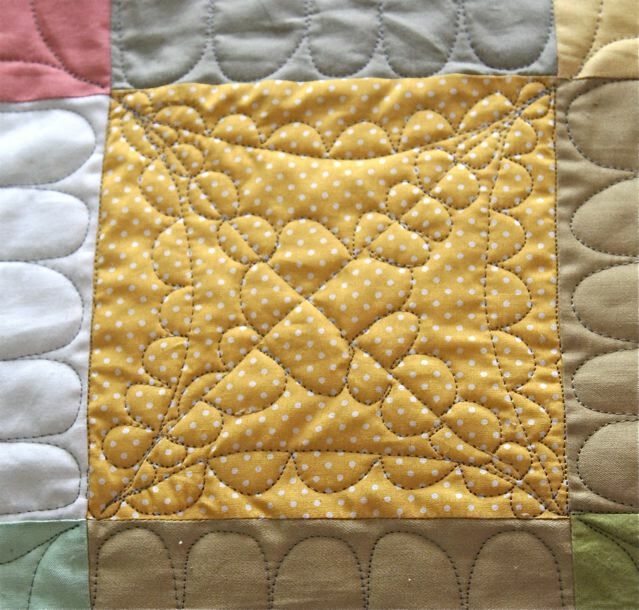 I've been doing some free motion quilting for the past few days, and it's been nice. I think I'm having fun with this particular layout because what I'm free motioning changes for every row. I'm hoping that in the far off future, when this quilt is at an antique store (in this scenario, I probably died and was eaten by any and all cats I happened to have) that whoever buys it and blogs about it in their thought clouds (which I'm guessing is what future blogs will be called) will call this quilting "charmingly folksy", rather than "bumblingly crafted". Don't get me wrong, I really like the way this is turning out, but oh man do my technical skills need some work. Up close there are some real messy bits, but luckily, the only person who knows or cares is me!